Thread: A nod to Rivendell..
From time to time you see a single speeder talk about 2 two – six speed bike. I think it’s almost amusing that to most people, a bike without index shifting is considered something other than a multi-speed bike. I also think that the advent of index shifting is partly responsible for single speeding as it is today. This weekend I was stuck in Solvang for three days with nothing to do; one has to use one’s motel room or you’ll loose it for the next year. I had intended to ride maybe 40 miles but my shoulder injury is more sever than I originally thought (read: torn rotator cup). Anyway this allowed me to read through the Rivendell 2006 Catalogue. 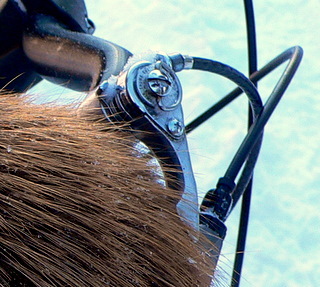 The following was a discussion of the Suntour Rachet shifter, but it applies to friction shifting in general. “Compared to the narrow, confined working environment of an indexed shifter (gotta use a special chain, derailleur, freewheel, cable housing, and so on), Suntour had a shifter…(that) worked with any derailleur, chain and cogs. Many on the board are too young to remember, but there was a time with friction shifters, when the most expensive part of the bike was the frame. If you had any multi-speed bike you could use any 3/32 chain, with any shifter, with any freewheel and any derialleur; Campy, Suntour, Shimano, Sachs, it didn’t matter. Pretty much all the components were interchangeable regardless of the speeds; 5,6,7 speed; again, it didn’t matter. I was interested to see that IRD is now making 5,6,7 freewheels again. Although cassette style freehubs probably last longer as a unit, the old freewheels allow for hubs identical the twist-on SS hubs of today. The biggest problem with this is with the exception of Phil Woods, nobody really makes the hubs anymore. Regardless, I wonder how many single speeders would be using 5 speed freewheels if they were as available as 9 speed hubs are today? Just a thought..
good call Brad, i've often amused myself with this as well. all respect to the 3-spd crowd....but an SS is one speed. I believe that Shimano still makes 5,6,7 speed freewheels. I like the idea of the freewheel...a wide range of interchangeability but I don't like how easy it is to bend a axle with such a set-up. I had a old road bike with a 600 Freewheel hub and 6 speed freewheel and down tube shifters, within a span of 3 months commuting I bent 3 axles. Shimano still makes a few 7 speed cassettes. The IG60 11-28 is listed at only 17g heavier than the 9 speed XTR M970 11-32. Already said elsewhere, but again, best part of #39 was: "Not included inside..."
Hey, check your pm's, I actually was gonna go see Grant within a week or two, wanna go with?? It'll be a Monday or Tues, I have a 650 B SS project in mind, kinda rethinking my setup like I had on the '72 Schwinn. You should go!! Regardless, I wonder how many single speeders would be using 5 speed freewheels if they were as available as 9 speed hubs are today? Just a thought..
Not too many after they've broken a few axles on the trail and had the bearings pour out. The cassette hub was the best advancement for off-road bikes since the bicycle itself in my mind. I've been riding long enough to have had to walk out of the woods quite a few miles after a broken axle on a freewheel hub with a long unsupported axle. I still have bikes with freewheels and boxes of cogs, bodies, and spacers. . . and spare axles for all the hubs. The best thing you can do with a wheel with multi-speed freewheel hub is switch the spacers from one side to the other, re-dish the wheel, and slap a one-speed BMX freewheel on it. Your assuming that the freewheel and hub technology would not have advanced since the 70's. The axle problem came with the later 7,8 speed freewheels and the use of road hubs on mountain bikes; it boils down to more of a spacing issue. Since the earlier spacing was only 120mm, you could use BMX spaced dropouts with a 5 speed freewheels (many did) with little problem of broken axles. It is with the 130mm, 135mm spacing and 7-8 speed freewheels that axles started to snap. Again, it was the un- necessary added cogs that forced the bike industry to widen the dropouts. The Phil Wood freewheel hub axles out there are much beefier than earlier freewheel hubs and their axles don't brake. So in both cases there are/where solutions to the broken axle problem. Had the industry continued to make 5 speed freewheels as the industry standard, there would have been no need to expand the dropouts to 135mm. Further the answer to backwards combatibility would have simply been to use thicker axles (which they are doing today anyway). Even if they would have stuck with 120mm spacing, nothing would have stopped the industry from beefing up the hub axles for mountain biking. Remember, this is a what if; and I defy anyone to argue the need for a 9 speed hub and inherently weaker drive train for mountain biking. Yes. But then it went to 130mm and has stayed there for 8, 9 & 10 speed road kit (so far - just wait til they turn it up to 11). 126 for 6,7 speed. 130 for 7 speed MTB. Source Sheldon Brown. As a Retro Grouch I'm going w/ 5 speeds as the perfect MTB cassette/freewheel ; Hey it's my post so I can choose what ever I want. I love what you've done with the place; or..
perhaps it's time to find a paradigm of acceptence. Somehow I see this as the role of singlespeed. Finding and using that which works, regardless of what we have been spoon fed by Shimano. Very nice..
And yes, as always another great edition of the RR. Yeah, I love Grant's playfulness in his writing. I think people take him too seriously though. Makes me wonder if he throws ideas out there just to see how far people will go to follow them. Except the '86 Bridgestone MB-1 shipped with a 5-speed FW on a 126mm hub. Now it's just a matter of figuring out what kind of gearing to use... a 2 by 5 is probably the way it will go since that will offer some optimum chainline and I can run larger rear cogs with my 44 tooth front ring for smoother high speed XC and road riding. After logging so many miles on the SS bikes I have come to realize, even more, that there is really no need for me to have 24 or 27 speeds on a bike and a simpler smoother running drive is a far better option. 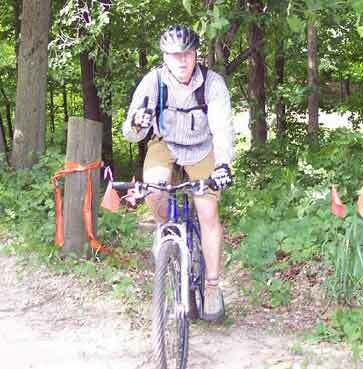 If I'm not running one gear on the trail I figure I'll be running 6 or ten at the most. My road bikes all run 18 speed (3 by 6) drives and all use old school friction shifters or shifters than can be switched from friction to indexed. Well what do you expect..
That was Grant pushing the envelope again I still like the idea of keeping 120mm spacing. Last edited by aka brad; 03-18-2007 at 10:31 AM. Your assuming that the freewheel and hub technology would not have advanced since the 70's. Brad I'm not assuming jack. I've been pulling a wrench since the early 80s and am currently the service manager of a pro shop in Vancouver, B.C. I've been there and am doing that every day. You are correct that Phil Wood axles are hard to break, the main reason is that they aren't threaded. A thread in an axle with a large unsupported area like on 99% of freewheel axles acts just like a stress riser. This causes easy breakages just like on the Campagnolo axle I had to replace on my wife's commuter last week. Her bike was a strict commuter with a 126 mm spaced hub and an ultra-6 freewheel. If you take something like this and ride it off-road you'll have problems, period. I agree that things are becoming close to madness with the number of cogs. The problem remains that even of you're using fewer cogs with the modern stuff it's is still mostly 9 speed stuff. 9 and 10 speed stuff is thin and still wears out quicker than 6-7-8 speed stuff. Singlespeed is great because you can use nice thick cogs and 1/8" chains that don't wear or flex as much as modern thin stuff. In the end using fewer cogs and rings doesn't make a difference unless you're using the old school stuff. Now a project like Nat's could be be done with 1/8" stuff if the rear derailer pulleys are spaced out a little further and the front cage was "manipulated" a bit. Back in the early 50s you could buy 4-speed freewheels with 1/8" cogs, but today you can just use 1/8" single speed cogs on a cassette hub. One of my favorite sayings when it comes to gears is, "Fewer isn't better, better is better." I still like the idea of keeping 120mm spacing. Here I totally agree, 120 spacing is king when it comes to one gear. With 120 you get great heel and chainring clearance. Low tread factor, nice dish, and little unsupported axle are also benefits. The main problem is being able to use a decent sized (2.2"+) tire for off-road use. I've designed a few frames for off-road use that use 120 mm track hubs and the problem always comes back to chainring clearance vs. tire clearance. There are quite a few workarounds, but geometry always wins. "In the end using fewer cogs and rings doesn't make a difference unless you're using the old school stuff." Perhaps we'll see a devolution of sorts as people move toward simpler and stronger designs and one advantage of running less cogs with modern parts is the reduction of chain deflection and getting straighter chainlines through the drive's range. This will extend the life of the drivetrain and increase power output. Getting high quality chromo axles isn't a problem if you can make them yourself or know someone who can... I can still buy them here at the LBS but can also machine my own. I prefer running skinnier tires (1.95's) and find that the occasional traction issue is offset by their faster roll (I ride alot of SS) and if you're rolling 29 inch tires you already have a larger contact area which can offset a need to run wider tires. 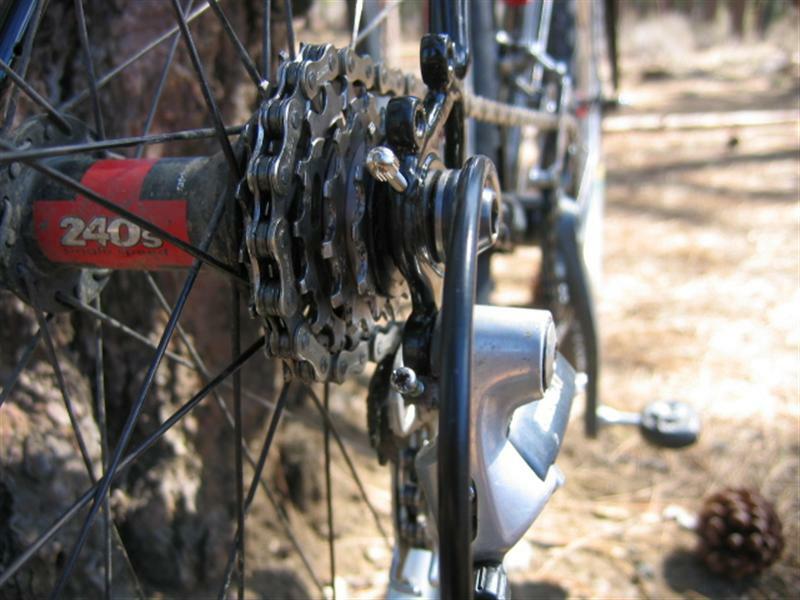 Using non ramped cogs is a good idea and using BMX cogs and 1/8 chain is a step up over that in a reduced gearing setup. If you're going to run less cogs you might as well make the remaining cogs stronger. MonkeyB, believe me I don't take myself very seriously. But you more or less proved my point. "You are correct that Phil Wood axles are hard to break, the main reason is that they aren't threaded. A thread in an axle with a large unsupported area like on 99% of freewheel axles acts just like a stress riser." and " The biggest problem is that shops just don't stock the axles much anymore." By your own words the only R&D in the last 30 years that has been thrown the way of freewheel hubs seems to be the threadless axles by Phil Wood. Imagine if the same R&D was thrown @ five speeds, the way they did with shifter and chain technology for 8,9, and 10 speeds. If nothing else, imagine if parts makers bumped up the diamater of some quality CroMo axles on the old freewheel style hubs. You would have a bullet proof 5 sp hub/freewheel that would work off road with no problem. As I said before, the issue here is dropout spacing. I don't suppose that a 135mm frewheel hub will work. But 120/126mm would. The time has passed us by, but it would have worked. We still have the technolongy to make 5 speed cassettes and I think it's still worth doing. Now a project like Nat's could be be done with 1/8" stuff if the rear derailer pulleys are spaced out a little further and the front cage was "manipulated" a bit. I am considering reducing the number of rear cogs in order to use a 1/8" chain (red, of course). After today's ride I can see that I'd be fine with three in the rear, because the jumps in tooth number is so tight. Mostly I like the idea of having a "10-speed." Do you all think that a 1/8" chain has enough side-to-side flex to handle indirect chainlines? I don't expect too many problems with my 2 by 3 that's running multi-speed chain with 7 speed HG cogs... the chainline with 3 cogs is very straight with negligible deflection and if I'm not towing a trailer or doing extreme climbing it gets run as a 1 by 3. I have a 15 tooth (ramped) cog to replace the 13 and believe that a 3 tooth jump will be much smoother and the 15 will handle high loads better, make me spin a little faster, and run much smoother. The deflection angles on my 2 by 8 (Trek) are relatively immense and I expect that to be much improved once I am running a 2 by 5 with the existing 8 speed cogs. If I have to, I can always machine a few custom spacers to centre the middle cog between the two front rings and optimize chainline through the gear range. I believe that many folks who suffer from bent cog teeth are the ones who run their bikes in "bad" gears under high loads with high deflection angles as the lateral stresses are immense. It's nice to run a bike where deflection issues are virtually nonexistant as this is one of my big gripes about 3 by 8 and 3 by 9 setups. With the 2 by 7 there is also no gear overlap. I believe that this whoe gear reduction movement is really catching on... you don't have to go as far as running a singlespeed but the virtues of running no more than 5 rear cogs with a double up front has a lot going for it. I also expect that the long term riding report will reveal that this kindof setup greatly extends the life of chains, rings, and cogs, and pulleys as I found this to be the case with my Trek when it was a 1 by 7. Perhaps bike companies will even start to take notice of the folks who are taking their bikes apart and removing the gears they don't need and start to offer bikes with reduced gearing options. Narrower dropout spacings, wheel swith less dish and 5 speed freehubs would be awesome. Set it and forget it: I love friction! I love friction shifters. My 1x8 has an original 1983 Suntour Power Thumb. I installed the rear derailleur, set the limit screws, attached the cable, and in six months I haven't touched it. Totally accurate shifting. Compare that to my wife's new bike, set up 2x8 with cursed rapid-fire shifters: I have been playing with it for a week and still can't get the shifting exactly right. I just don't understand how you can have a shifting system that doesn't let you trim the front derailleur. I especially hate front derailleurs, they are the work of the devil. Indexed front derailleurs rate as one of the worst ideas ever for any type of bike. I run some Deore rapid fire shifters on my 2 by 8 and have set up the front shifter so that I can trim it a few degrees althouhg I'm on the hunt for some Suntour shifters of my own. Is it not more of a chainline issue than a chainring clearance issue? I'm guessing everybody wants a perfect chainline, so then it becomes a chainring clearance problem. If you don't mind a crappy chainline then the ring clearance doesn't matter much. To bend the stays enough to get good tire clearance with the 120 hub you run into problems of the ring digging into the stays. You could respace the rear axle and move the cog as far outboard as possible and that would help since you'd also move the ring away from the bike the same distance. Also chainstays longer than 460 mm (18"+) and rings 32 teeth and smaller could also do it I think. If you play around with BikeCAD at http://www.bikeforest.com/CAD/index.php I think the free on-line version will allow you to look at chainring clearance in relation to the chainstays. My version of BikeCAD Pro sure will. You can do this all on paper too. First you'll draw an "I" shape 430 mm though the center section and 120 mm at one end and 68 mm at the other. This is a rear triangle with 17.25" chainstay length. The 68 mm line represents the back of your BB shell and the 130 line the rear axle. Fill in the BB shell so it's a box 68 mm x 40 mm and draw in some 5 mm x 15 mm squares at the ends of your axle marks to represent your dropouts. Now it's time to draw the tire. Mark the spot 280 mm + half the tire diameter. The 280 is half the rim diameter of a (559) 26" wheel. Using the spot on the line draw a circle to represent the tire of the size you want. The rest is really up to you and picking what chainstay style you want. When you start mocking up the chainstays themselves remember that builders generally have the outside of the chainstay 5 mm from the outer face of the BB shell. Measure your chain lines and chainring diameters and mock them up on your drawing. Try different tire combinations. If you've made it this far and haven't wandered off to go ride your bike or get a beer and drawing bike frames interests you check out the lo-fi frame drafting tutorial I made years back at my site http://www.ivycycles.com/framedrawing/frame1.html. On a SS the chainline must be straight. With a 120 hub the cog can only go so far out. Now the limiting factor for tire width is the chain hitting the side of the tire. Does not matter what the chainstay shape, BB shell width or chain ring size is. By your own words the only R&D in the last 30 years that has been thrown the way of freewheel hubs seems to be the threadless axles by Phil Wood. Imagine if the same R&D was thrown @ five speeds, the way they did with shifter and chain technology for 8,9, and 10 speeds. If nothing else, imagine if parts makers bumped up the diamater of some quality CroMo axles on the old freewheel style hubs. You would have a bullet proof 5 sp hub/freewheel that would work off road with no problem. As I said before, the issue here is dropout spacing. I don't suppose that a 135mm frewheel hub will work. But 120/126mm would. The time has passed us by, but it would have worked. We still have the technolongy to make 5 speed cassettes and I think it's still worth doing. I'm not a huge, but definitely a big guy, based by height, and plenty strong legs, Chris King hubset, with a heavy duty option. Very little threading, stainless steel inserts, and well, King quality. Not the "true" singlespeeder mindset as far as expense and budget, but, yeah, just thought I'd throw that out there. And, yeah, manufacturers need to go back to a better chromoly, stainless steel, or other high tensile strength axle. On that note, and along the lines of the 120mm thought process, what is this I hear about Suzue closing down production?? Not enough demand?? WTF?? You're correct that one of the problems could be the chain hitting the tire. Also by bringing the rear end width down by 15 mm you will have to manipulate the chainstays more to get them to clear the tire. Basically the bend closest to the BB shell needs to be sharper outward so that when the stays close together at the narrower 120 mm dropouts there is still clearance for the tire. Because of this sharper bend your chainring will dig into the chainstay with a ring say about 36 teeth or larger. If you don't have to bend the stays your problem then becomes chain clearance. A track set-up is a chainline of 46 mm generally and single-speeds tend to run in the low 50s, lets just say 53 and that the actual tire difference being 15 mm. In theory that's the difference between a 1.9" and a 2.25". Of course as you, better than most people, know tires come in all kinds of sizes and what it says on the sidewall doesn't really mean squat. What we're both saying is similar just coming from a different direction. Yours from the tire direction and mine from the frame design and construction direction. Your view places emphasis on anything obstructing the tire, and mine from anything obstructing the frame. So we're not so different in our views as you might believe.